The Republic of Benin, formerly called Dahomey, is one of Africa's smallest countries. Capital: Porto-Novo. Republic, 105,869 sq mi (274,200 sq km), W Africa. Ouagadougou is the capital and largest city. Republic, c.1,560 sq mi (4,040 sq km), W Africa. It is an archipelago made up of 10 islands and 5 islets. Republic, 124,503 sq mi (322,463 sq km), W Africa. The official capital is Yamoussoukro; the largest city, commercial center, administrative center, and former capital is Abidjan. Republic in Western Africa. 11,295 sq km. Almost an enclave of Senegal; smallest country on the continent of Africa. Capital: Banjul. Country in West Africa. Area: 238,540 sq km/92,100 sq miles. Capital: Accra. Republic. Can be divided into four regions: an alluvial coastal plain, which includes the capital, Conakry; the highland region of the Fouta Djallon; the NE savanna; and the SE Guinea Highlands. Republic, 13,948 sq mi (36,125 sq km), W Africa. The country includes the nearby Bijagós (Bissagos) Archipelago and other islands. Bissau is the capital and only large city. Republic, 43,000 sq mi (111,370 sq km), W Africa. Monrovia is the capital, largest city, main port, and commercial center. Independent republic, 478,764 sq mi (1,240,000 sq km), the largest country in W Africa. Bamako is the capital and by far the largest city. Republic, 397,953 sq mi (1,030,700 sq km), NW Africa. Nouakchott is the capital and largest town. Other towns include Atar and Kaédi. A landlocked nation in N central Africa. The narrow Niger Valley is the country's most fertile and densely populated region and includes the capital, Niamey. Republic, 356,667 sq mi (923,768 sq km), W Africa. Abuja is the capital and Lagos is the largest city. Island, 47 sq mi (122 sq km), in the S Atlantic Ocean, 1,200 mi (1,931 km) W of Africa. Together with the islands of Ascension and Tristan da Cunha, it comprises the British dependency of St. Helena. Country in West Africa, on the Atlantic Ocean. Bounded north by Mauritania, east by Mali, south by Guinea and Guinea-Bissau, and enclosing the Gambia on three sides. Capital: Dakar. Republic, 27,699 sq mi (71,740 sq km), W Africa. Bordered by the Atlantic Ocean in the west, by Guinea in the north and east, and by Liberia in the south. Freetown is the capital. Officially Togolese Republic, republic (2005 est. pop. 5,682,000), 21,622 sq mi (56,000 sq km), W Africa. Lomé is the country's capital and its largest city. Officially People's Democratic Republic of Algeria, republic, 919,590 sq mi (2,381,741 sq km), NW Africa. Algiers is the capital and largest city. Country in northeast Africa. Capital: Cairo. Major ports: Alexandria, Port Said, Suez, Damietta, Shubra Al Khayma. Officially Great Socialist People's Libyan Arab Jamahirya [state of the masses], republic, 679,358 sq mi (1,759,540 sq km), N Africa. Tripoli is the capital of Libya and its largest city. Country in northwest Africa. Capital: Rabat. Major towns/cities: Casablanca, Marrakesh, Fès, Oujda, Kenitra, Tétouan, Meknès. Republic, 967,494 sq mi (2,505,813 sq km), NE Africa. Khartoum is the capital and Omdurman is the largest city. Officially Republic of Tunisia, republic, 63,378 sq mi (164,150 sq km), NW Africa. The capital and largest city is Tunis. Territory, 102,703 sq mi (266,000 sq km), NW Africa, occupied by Morocco. Officially Republic of Angola, including the exclave of Cabinda, 481,351 sq mi (1,246,700 sq km), SW Africa. Luanda is the capital, largest city, and chief port. 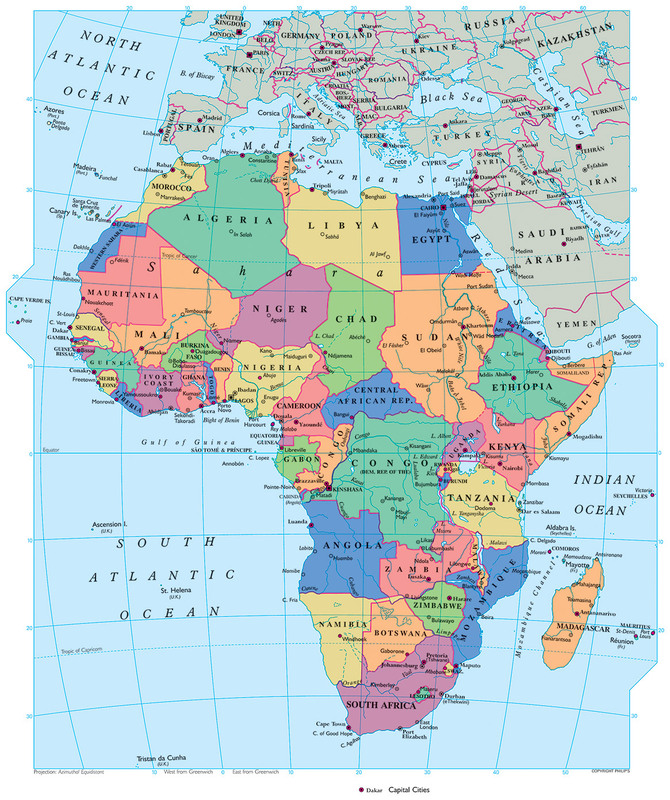 Country in west Africa, bounded northwest by Nigeria, northeast by Chad, east by the Central African Republic, south by the Republic of the Congo, Gabon, and Equatorial Guinea, and west by the Atlantic. Republic, 240,534 sq mi (622,983 sq km), central Africa. Bangui is the capital and largest city. Republic, 495,752 sq mi (1,284,000 sq km), N central Africa. Ndjamena is the capital and largest city. The Republic of Congo lies on the River Congo in w-central Africa. The equator runs through the centre of the country. Capital: Brazzaville. From Geography of the World. The Democratic Republic of Congo is Africa's third-largest country. Central Africa, northeast of Angola. Capital: Kinshasa. Republic, 10,830 sq mi (28,051 sq km), W central Africa. Malabo, situated on Bioko, is the capital and largest city. Republic, 103,346 sq mi (267,667 sq km), W central Africa. Libreville (the capital) and Port-Gentil, both seaports, are the country's only large cities. Republic, 372 sq mi (964 sq km), W Africa, in the Gulf of Guinea. São Tomé is the capital and chief town. Officially Republic of Botswana, republic, 231,804 sq mi (600,372 sq km), S central Africa. Gaborone is the capital and largest city. Officially Kingdom of Lesotho, kingdom, 11,720 sq mi (30,355 sq km), S Africa. Maseru is the capital and largest city. Republic, c.318,000 sq mi (823,620 sq km), SW Africa. The capital and largest city of Namibia is Windhoek. Country on the southern tip of Africa. Capitals: Cape Town (legislative), Pretoria (administrative), Bloemfontein (judicial). Kingdom, 6,705 sq mi (17,366 sq km), SE Africa. The capital and largest city is Mbabane. Republic, 10,747 sq mi (27,834 sq km), E central Africa. Bujumbura is the capital and largest city; Gitega is the only other major town. Country in the Indian Ocean between Madagascar and the east coast of Africa, comprising three islands - Njazidja (Grande Comore), Nzwani (Anjouan), and Mwali (Moheli). The Republic of Djibouti is a small country on the NE coast of Africa. Djibouti contains the lowest point on the African continent, Lake Assal, at 155m [509ft] below sea level. The capital is also Djibouti. Republic, c.48,000 sq mi (124,320 sq km), NE Africa. Asmara is the capital and largest city. Republic, 471,776 sq mi (1,221,900 sq km), NE Africa. Addis Ababa is the capital and largest city. Republic, 224,960 sq mi (582,646 sq km), E Africa. Nairobi is the capital and largest city. Republic, 226,658 sq mi (587,045 sq km), in the Indian Ocean. The capital and largest city is Antananarivo. Republic, 45,200 sq mi (117,068 sq km), E central Africa. The capital is Lilongwe; Blantyre is its largest city and commercial capital. Republic, 790 sq mi (2,046 sq km), in the SW Indian Ocean. It is part of the Mascarene Islands. The capital is Port Louis. Country in southeast Africa. Capital: Maputo (and chief port). Major towns/cities: Beira, Nampula, Nacala, Chimoio. Republic, 10,169 sq mi (26,338 sq km), E central Africa. Kigali is the capital and largest town. Island and overseas department of France, c.970 sq mi (2,510 sq km), one of the Mascarene Islands, in the Indian Ocean. Saint-Denis (the capital) and Le Port (the leading port) are the chief cities. Country in the Indian Ocean. Comprises two distinct island groups: one, the Granitic group, concentrated, the other, the Outer or Coralline group, widely scattered; totals over 100 islands and islets. Capital: Victoria. Country, 246,200 sq mi (637,657 sq km), extreme E Africa. It is directly south of the Arabian peninsula across the Gulf of Aden. Mogadishu is the capital. Republic, 364,898 sq mi (945,087 sq km), E Africa. The Tanzanian legislature moved to the new capital of Dodoma in 1996, but many government offices still remain in Dar-es-Salaam. A landlocked country in S Africa. Capital: Harare. River in Africa, the world's longest, 6,695 km/4,160 mi. Second-longest river in Africa (after the Nile), rising near the border of Zambia and the Democratic Republic of Congo. In Encyclopedia of World Trade From Ancient Times to the Present Opened in 1869, the Suez Canal connects the Red Sea to the Mediterranean Sea through the narrow isthmus linking Africa to the Middle East. Regional divisions on this page follow the UN Standard Regional Codes for Statistical Use. World's largest desert, c.3,500,000 sq mi, N Africa; the western part of a great arid zone that continues into SW Asia. Arid to semi-arid desert area, occupying a plateau and forming most of Botswana and extending into Namibia, Zimbabwe, and South Africa. Geological fault system of SW Asia and E Africa. Cape Horn is the southernmost tip of South America within Chilean territorial waters and is located in the Tierra del Fuego Archipelago. Region and former sultanate, W Sudan. Since 2003 the region has been the scene of fighting. An estimated 50,000 persons have died in the fighting, and another 150,000 have died from disease, hunger, and other causes, and the government and janjaweed have been accused by some of genocide. Triangular peninsula, c.23,000 sq mi (59,570 sq km), NE Egypt. Under the Camp David accords (1978) and Egyptian-Israeli peace treaty (1979), Israel returned virtually the whole of Sinai back to Egypt; the process was completed in 1982.